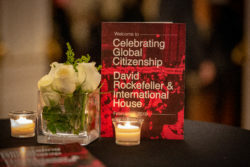 New York – International House was honored to host a private event on February 4, 2019 in celebration of David Rockefeller and his lifetime connection to International House. A reception was held in the Hall of History, where newly discovered archival photographs were on display. In Davis Hall, International House President and CEO Calvin Sims greeted more than 160 guests by unveiling film footage that had been found within the International House archives only a few days prior. The footage shows David Rockefeller in 1974 discussing the importance of International House in the advent of its 50th anniversary Golden Jubilee. Distinguished guests, which included family members and colleagues, shared reflections and remembrances of David Rockefeller. 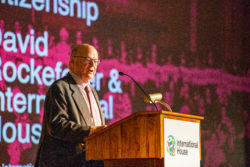 Peter O’Neill, the grandnephew of Rockefeller as well as an I-House Alumnus (’92) and current Chair of the Executive Committee, spoke of his great-uncle’s strong vision of global interdependence, his empathy towards others from all backgrounds and cultures, and his belief in fostering international dialogue. Guests were reminded that David Rockefeller was a child when his father, John D. Rockefeller, founded International House with Cleveland H. Dodge in 1924. Having effectively grown up in the House, David Rockefeller held a commitment to the I-House mission that led him to serve as a Trustee and to remain actively involved with the I-House community for more than seven decades. “His giving to this House was unstinting,” said Ambassador and Chair of the Board of Trustees Frank Wisner in his keynote address, speculating that no other institution likely received so much of David Rockefeller’s time and support. Indeed, this generosity was a tradition of the Rockefeller family, with David Rockefeller’s niece Abby O’Neill and her son Peter serving on the I-House Board after him. Earlier in the evening, Sims had also announced in his opening remarks agift from the Rockefeller family of $9 million. A special book was created exclusively for the event and titled Celebrating Global Citizenship: David Rockefeller & International House. The author, from the Winthrop Group, was historian Heidi Druckemiller, who also gave a slideshow that shared photos, letters, and other memorabilia from their research which began in the summer of 2018. Much of the material was drawn from International House archives, in addition to the Rockefeller Archive Center, Columbia University, and the Museum of the City of New York. “The whole idea was to find things that are new,” Druckemiller said, explaining how Rockefeller’s 2003 memoir was helpful but many other intriguing records only became available to the public after his death in 2017. Of the recently uncovered documents was a ship manifest containing the names of seven Rockefellers, including David’s, then 12 years old when his family sailed aboard the RMS Majestic in 1927. As a student at Harvard, he visited Germany; guests were shown an image of his German driver’s licence from 1933 and a photo he took of Adolph Hitler in 1937 during a parade in Munich. “He was distressed to be there at that time,” noted Druckemiller. Also shared was a document from David Rockefeller in June 2015 addressed to President Sims, thanking him for a warm letter sent on the occasion of his hundredth birthday. “It has truly been a life filled with many happy and rewarding events, and that includes importantly my association with International House over many years,” he had written. The project uncovered additional items from International House’s forgotten past, including photographs of I-House Residents that were taken by Stanley Kubrick in 1947 when he worked as a New York-based photographer for Look magazine (a competitor of Life magazine at the time). After the slide presentation, remembrances were shared by friend and I-House Life Trustee Bill Moody, and Honorary Trustees Daisy Soros and Paul Volcker shared personal—and very moving—memories of David Rockefeller and I-House by video. 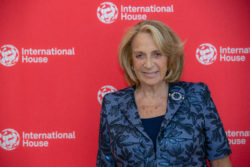 Soros, an Alumna (’51) as well as Trustee, candidly recounted the story of how she met her husband, Paul Soros, at I-House, and reflected on the impact of living with students from all over the world. Watch the video of Daisy Soros and Paul Volcker here. The final high point of the event was Trustee and member of the Dodge family Bill Rueckert’s presentation of the first-ever Global Citizenship Award to I-House Alumna Evgenia Sokolova (’12), co-founder and CEO of Aktivera, an impact advisory firm promoting the use of renewable energy technologies to enable income growth, job creation, and sustainable economic development. This award, created especially for this celebration of David Rockefeller’s lifelong relationship with International House, was intended as a vote of confidence to an I-House alum who is living a life that demonstrates many of David Rockefeller’s personal characteristics: respect for other cultures, seeking to improve the lives of others through public and private service, empathy for those less fortunate, and most of all, personal courage. Sokolova accepted the award by video from her home in Spain; in the final stages of pregnancy, she was under doctors’ orders not to fly to New York to attend in person. Her remarks conveyed the combination of entrepreneurial spirit and determination to do good works that inspired her selection. With humor and great humility, she provided a glimpse of the work she’s been doing over the years, which include solar projects in Africa, deploying NASA-based technology to make refrigeration available to African farmers, and her “Clean Cooking” project to improve biomass stoves. Her dedication to improving the lives of others came through the video and united the room. Watch Evgenia Sokolova’s Acceptance speech here. 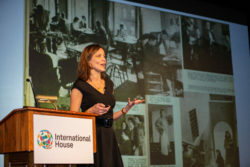 “Why don’t more people know about International House?” asks Daisy Soros in her video. She has a point, and for those who know I-House, the evening’s event deepened our appreciation for David Rockefeller’s outsized impact on this institution and how his many positive influences continue to be revealed. With more than eight years of experience as a professional writer and photographer, Kenneth Ingram has a diverse multimedia portfolio with contributions to CBC Radio, The Boston Globe, The Chronicle Herald, The Phnom Penh Post, South East Asia Globe, and others. He is one of only seven students in the Science concentration at Columbia University’s Graduate School of Journalism this year. He holds two undergraduate degrees from Nova Scotia, Canada: a Bachelor of Journalism from the University of King’s College and a B.A. (with Honours) in International Development Studies and Spanish from Dalhousie University. Read more of Ken’s work here.